Michel Parmentier is this artist's first-ever major retrospective in the United States. Traversing the distinct phases of Parmentier's production (and non-production), the show brings together nearly thirty works of art alongside rarely seen archival materials and personal ruminations. The story begins with Parmentier's early experiments in painting and collaborations with the artists Daniel Buren, Olivier Mosset, and Niele Toroni, then arcs to examine his years of artistic dormancy, only to build in intensity with his renewed quest for an indeterminate visual language in the years before his death. Over the course of his career, Parmentier developed highly controlled processes for his work; for instance, folding the canvas at measured intervals, painting the newly created surfaces monochromatically, then unfolding the canvas to reveal precisely registered strips of paint in 38 centimeter bands. 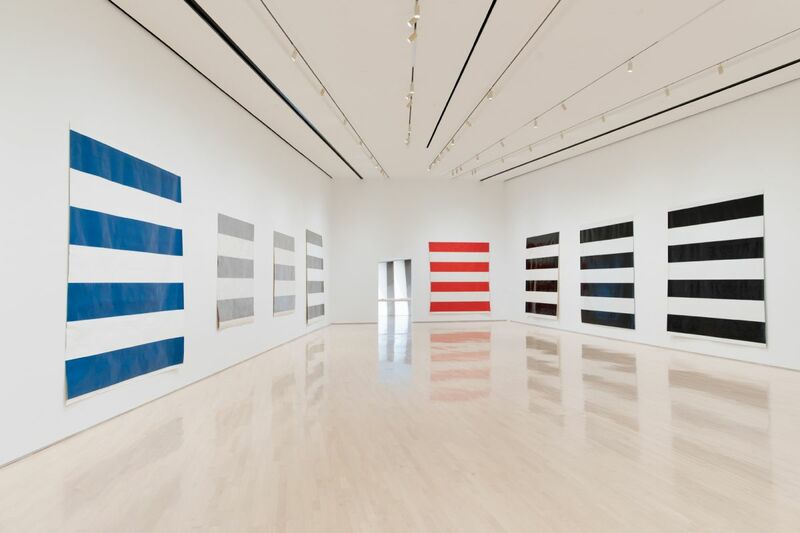 In his early works, Parmentier also changed the color of choice annually, beginning with blue in 1966, then moving to gray in 1967, and red in 1968. 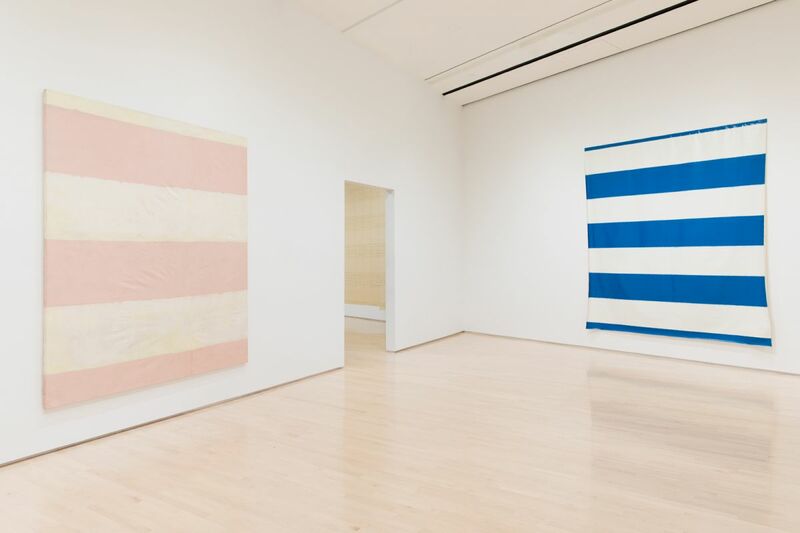 Around the same time, in early 1967, he joined Buren, Mosset, and Toroni (later identified collectively as BMPT) in vehemently challenging painterly subjectivity and traditional modes of authorship. A restless sense of discontent drew these artists together, but also broke them apart. Towards the end of the year Parmentier renounced his affiliation with the group, and a little less than a year later, in 1968, he announced his retirement from painting altogether. This radical gesture and ensuing fifteen-year hiatus from artistic production points to the power of his convictions and refusal to compromise. However, Parmentier returned to art-making in 1983 and immediately resumed where he left off with a new series of black paintings. 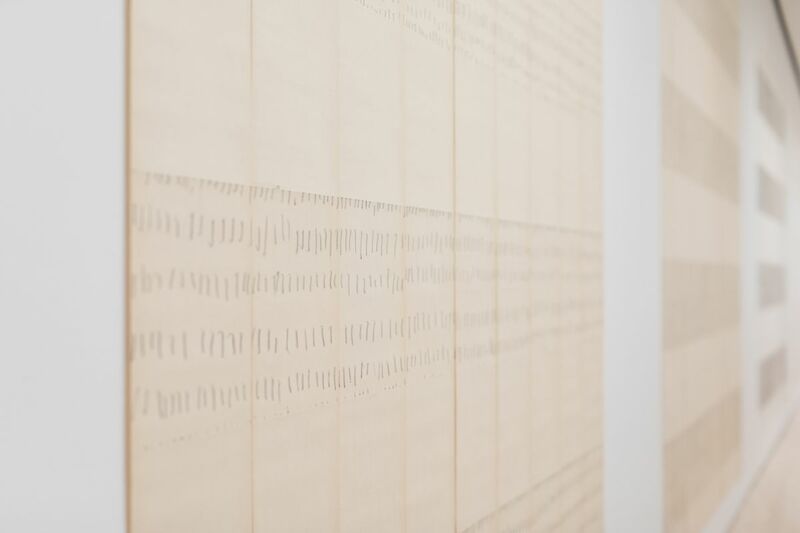 He also began experimenting with transparent tracing paper, barely visible graphite script, and other folding techniques to distance himself from producing works that were overly determined in both form and content. This unprecedented exhibition, which describes the life-long quest by the artist for pure forms of creative expression untethered from any concrete associations, will further encourage new generations of artists and scholars to grapple with Michel Parmentier, whose legacy looms large yet remains largely unwritten. 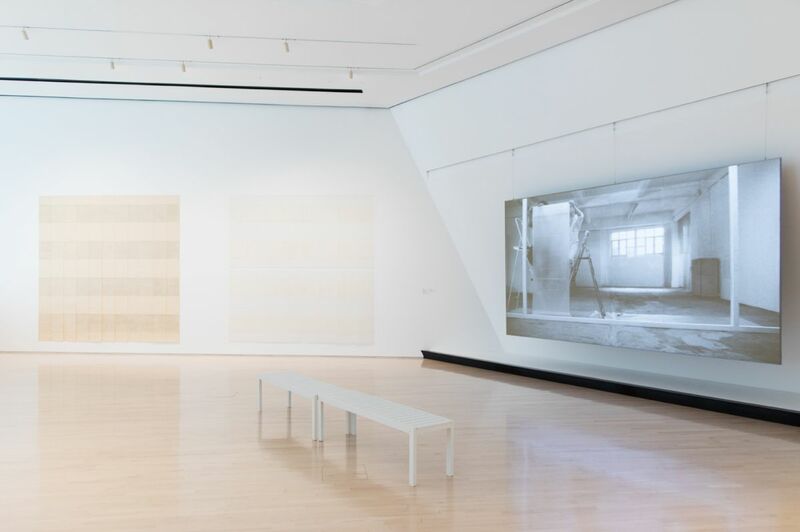 Michel Parmentier is organized by the Eli and Edythe Broad Art Museum at Michigan State University and curated by Marc-Olivier Wahler, Director, with support from Steven L. Bridges, Associate Curator. Support for this exhibition is provided by a gift from the estate of Dr. Clyde L. Burton and Étant donnés Contemporary Art, a program of the French American Cultural Exchange (FACE) Foundation. 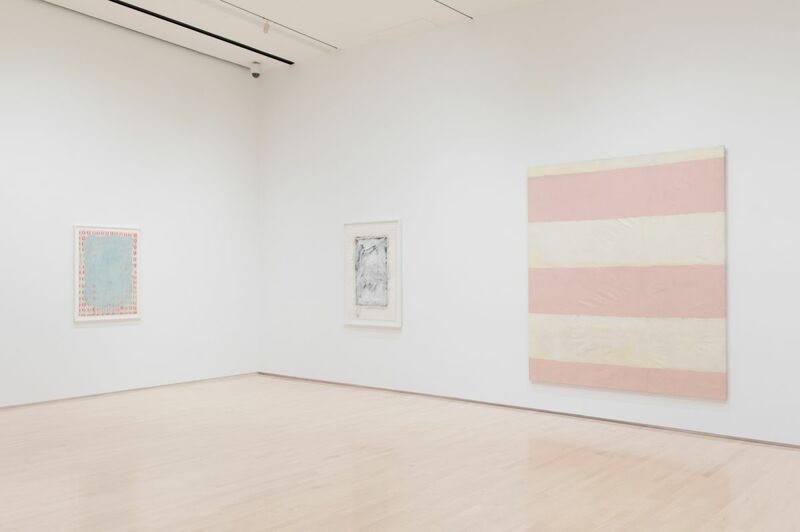 Étant donnés is developed in partnership with the Cultural Services of the French Embassy in the United States, with lead funding from the Florence Gould Foundation, the Helen Frankenthaler Foundation, the French Ministry of Culture, and Institut Français. Mine de plomb frotté sur papier, 7 bandes horizontales alternées de 38 cm de largeur (4+3) et, en haut et en bas, 2 bandes partielles vierges de 19 cm. Graphite rubbed on paper, 7 horizontal bands 38 cm wide in alternating tones (4+3), and, at the top and bottom, two partial neutral bands 19 cm wide. © ADAGP, Paris. The Estate of Michel Parmentier. AMP – Fonds Michel Parmentier, Bruxelles. Courtesy Loevenbruck, Paris. Photo : Fabrice Gousset. Pastel blanc appliqué à plat, verticalement, sur papier calque, 7 bandes horizontales alternées de 38 cm de largeur (4+3), et, en haut et en bas, 2 bandes partielles vierges de 19 cm. © ADAGP, Paris. The Estate of Michel Parmentier. AMP – Fonds Michel Parmentier, Bruxelles. Courtesy Loevenbruck, Paris. Photo : Bruxelles, Philippe De Gobert. © ADAGP, Paris. The Estate of Michel Parmentier. AMP – Fonds Michel Parmentier, Bruxelles. Courtesy Loevenbruck, Paris. Photo : Paris, Fabrice Gousset.